A few quick updates – I am now on Twitter @noflytripping – follow for a daily travel photo and other occasional updates. Also follow my Facebook page for more photos and hopefully some videos from the game below. Let’s be honest, Serbs have a bit of a reputation in “the West”, the civil war in Bosnia, the actions of Slobodan Milosevic, (and, as I might mention in another post, their own Military Museum) mean they are often portrayed as being rather warlike and aggressive and their pride in their identity can magnify this effect. All I can say is that my experience of Serbians during my time in Belgrade has been nothing like that, with everyone very friendly despite the fact planes from my country bombed their’s only 15 years ago as part of NATO’s campaign against Serbian actions in Kosovo. They are perfectly civilised people. The Belgrade derby between Red Star and Partizan is known as the “eternal derby” as both clubs came into existence after World War 2 and from the very beginning became the fiercest of rivals. Serbia has many football clubs now, but its fair to say practically the entire population supports one of the big two. It’s also fair to say that Serbian football is not exactly the pinnacle of the beautiful game. Red Star won the European Cup back in 1991. These days, Serbian clubs rarely get past the qualifying rounds. And whilst football is incredibly popular, this doesn’t translate into attendances. Go to a game, even one involving one of the big two, and you are likely to find yourself in a stadium less than a quarter full (on a good day!). The exception of course is when the big two play each other. Red Star are historically the most successful team in Serbia and have also had the better of the derby, even in recent years where Partizan has started to dominate the league. 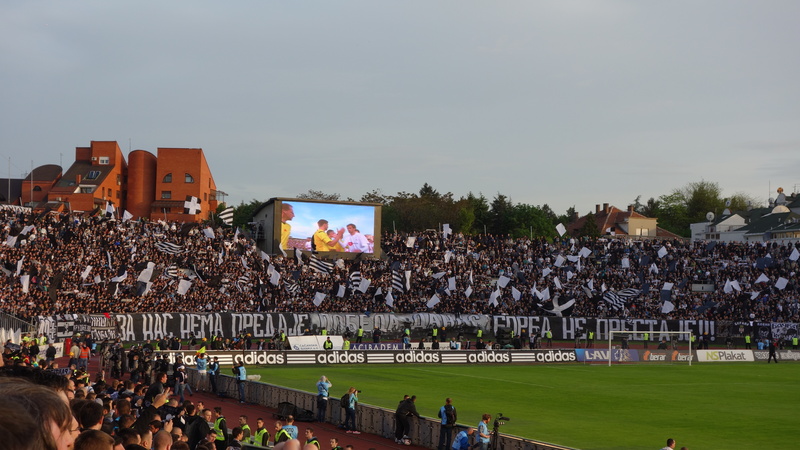 (Partizan has won the last 6 league titles). This year however, going into the game at Partizan’s stadium (about 2 minutes from Red Star’s), Red Star were poised to end Partizan’s run in the league, 6 points clear with 4 games to go. A win would all but mathematically give the title to Red Star, and realistically a draw would too. As I mentioned in my post on sport in Germany, I’ve always wanted to try to take in any big football games I happen to encounter on this trip. It looked though like I would be a week too early for the Belgrade Derby, and I was conscious of already being behind my approximate travel schedule. However a quick bit of research on their last encounter, which began with Red Star fans parachuting(!) 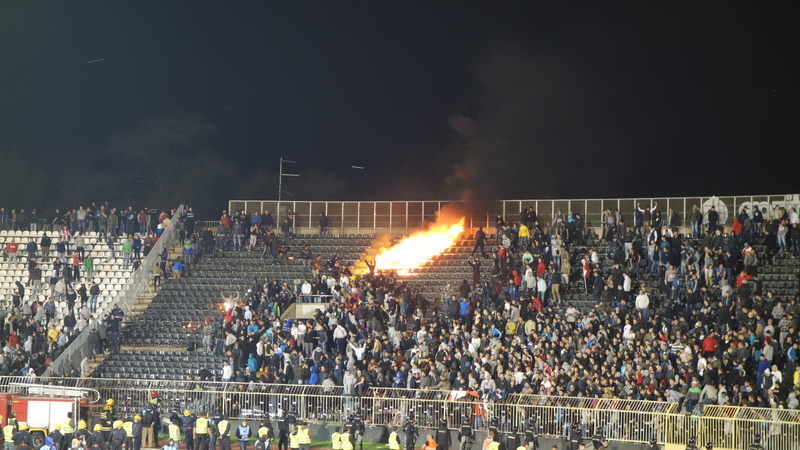 into the stadium and ended with Partizan fans setting fire to the Red Star ground as their team lost 1-nil, with an unholy amount of flares in between convinced me that it would be worth the further delay in my progress across the world. So having convinced, with the help of some beer money, a fellow traveller to secure me tickets, I spent the week in Budapest, arriving back in Belgrade on the morning of the match, where a ticket was now waiting for me at the hostel. 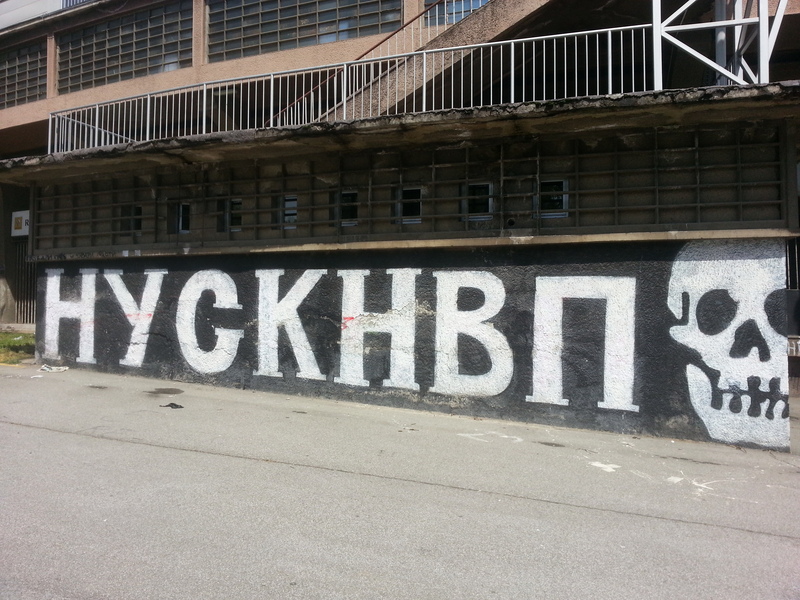 Partizan graffiti – friendly isn’t it? Heading to the ground, two things quickly became apparent. First, Serbian riot police are huge and were seemingly everywhere. Secondly, no one wore colours. It’s fair to say no one wants to advertise themselves as a supporter of either team and hence advertise themselves as a target for the other. Still, the stern-faced riot police meant I felt perfectly safe as I approached the ground and got increasingly caught up in the swell of supporters. At this point it occurred to me that I didn’t really know where I was heading to. My ticket specified an entrance but there was no sign of any identifying signs on the stadium to indicate which one was the one I wanted. From inside the stadium, the sound of firecrackers and other small explosions made me keen to find a way in as soon as possible, so despite kick off still being just under two hours away I managed to guess the right entrance and made my way inside. After a cursory pat down, (not quite the hard-core security I had been given to expect) I found myself inside by my seat, although as far as the game was concerned I suspected that I wouldn’t be sitting on it much. The stadium was impressively full given how far away the game actually was from kick off. 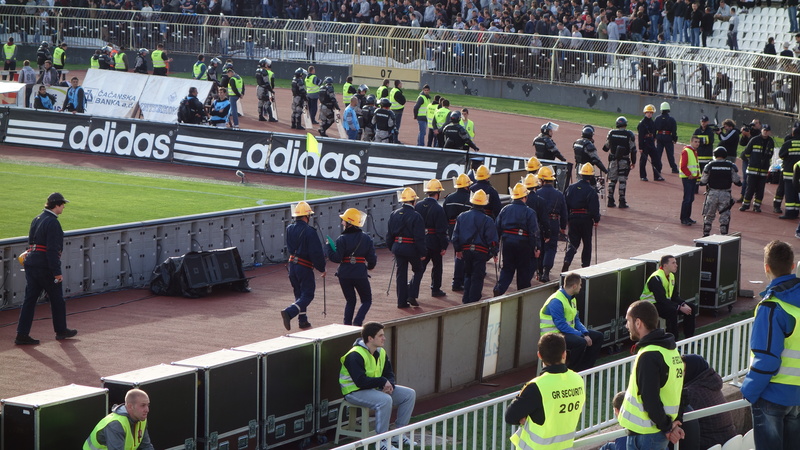 Entertainment in the intervening period was provided by the intervention of some riot police trying to stop fans who didn’t have tickets for the North Stand, where the hard-core Red Star fans stood, climb over a security fence to join their fellow supporters. It was slightly disconcerting to see fans run towards where I was stood with riot police chasing behind them and the odd truncheon blow landing on those who still fancied their chances, but it was over soon enough and no attempt was made to remove those who had made it. As the crowd began to swell, the chanting from both sides increased, although the decision to blare random rock style Partizan supporting songs from the PA in between the odd advert did take the edge off it a bit. Perhaps its worth a few quick words about how the seating plan works at games like this. 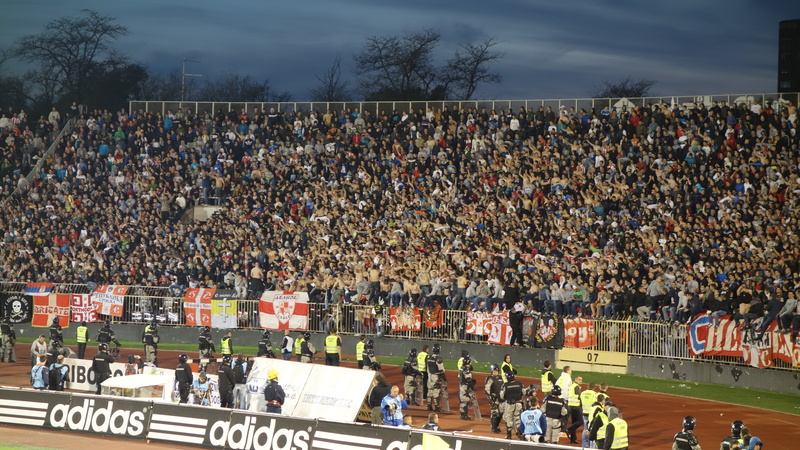 Red Star’s hard-core support get the North Stand, whilst Partizan take the South Stand, and part of the East Stand. The rest of the stadium is officially neutral, although the majority of the East was for Partizan and the West for Red Star. It struck me as a sad indictment of football in England, that here in Serbia, in the biggest of derbies, they can handle a stadium plan that, ultras apart, allows the rest of the viewing public to mix, regardless of their affiliation and without this seemingly causing any problems. 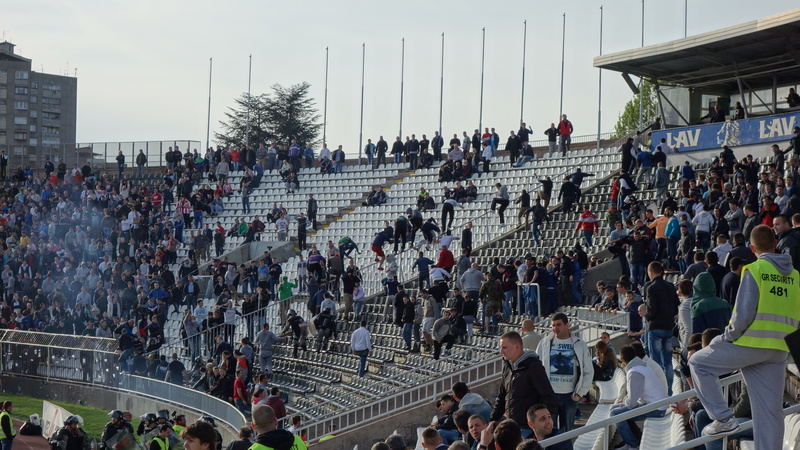 Indeed the only “gap” in the seats, separating two sets of fans, was between two sets of Partizan supporters. For reasons apparently to do with rivalries over how the club is run, Partizan has several supporters groups who its fair to say hate each other seemingly as much as the opposition and so need to be separated. At Partizan’s previous meeting with Red Star, they had even gone so far as to have a mini riot amongst themselves, throwing flares and other things at each other, whilst Red Star fans looked on in amusement. Fenced off area between rival Partizan fans is to the left of the picture. In all my later photos its obscured by smoke! There was no such infighting on this occasion however, and the noise rose to new heights as the PA was switched off and the teams came out. 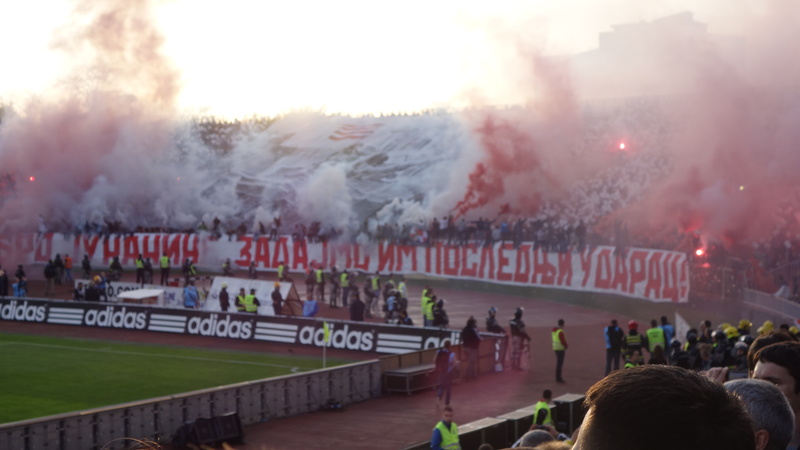 The Partizan fans erupted into a mass of flag waving and chanting, whilst at the Red Star end, a huge flag showing a tank flying the Red Star colours was unveiled, together with a choreographed display of balloon waving and smoke. If there was any doubt in my mind that this game was going to be epic off the pitch, regardless of what happened on it, then it had now evaporated! 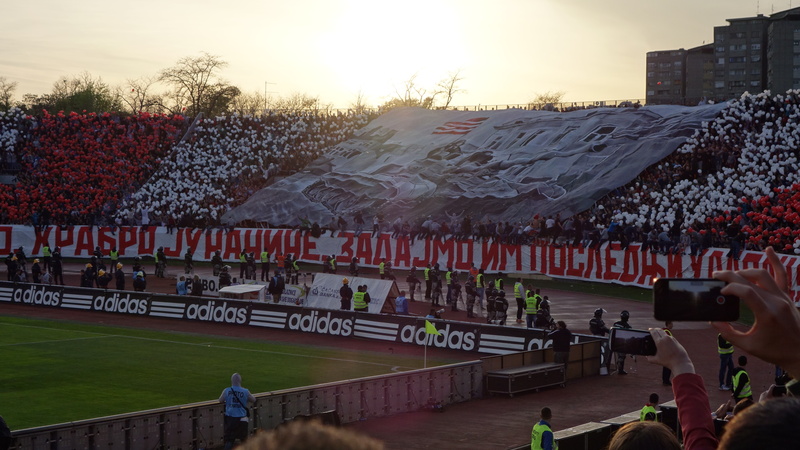 Red Star had an even bigger flag – and balloons! And the game on the pitch did not disappoint either. Partizan made most of the early running, spurning several good chances before Red Star were awarded a penalty in front of the disbelieving Partizan fans. I had been planning on supporting Red Star, owing to the fact that their captain, Nenad Milijas had played for my team, Wolves, several years earlier. However, caught up in the moment, and perhaps influenced by the fact I was mostly surrounded by Partizan fans, I shouted out my indignation at the decision with the rest of the Partizan fans. Nenad Milijas, (who for any Wolves fans reading, is now even slower!) might have been expected to take the penalty, but for whatever reason he allowed a team-mate to do so. A goal seemed inevitable, with the Partizan keeper apparently carrying an injury to his right shoulder, but instead – SAVED! The Partizan fans went wild, celebrating it as if they themselves had scored a goal. In truth it was a terrible penalty, low and so close to the keepers right that even Paddy Kenny would have been able to save it. With the Partizan fans still celebrating, their team won a free kick up the other end of the pitch and before many had realised what was happening they had scored to take the lead! The fans went even more barmy, smoke and firecrackers were let off and for the first and briefest of times the Red Star fans were silenced! What a few minutes of football! But we were barely over 30 minutes gone, there was still plenty of the game to go, and minutes later I could hardly believe it as Red Star won another penalty! A different player this time, but unbelievably, he produced a carbon copy of the first effort, and after a save and a goal mouth scramble, the game remained 1-nil to Partizan. If Chris Kamara had been watching this game for Soccer Saturday he would have just exploded. 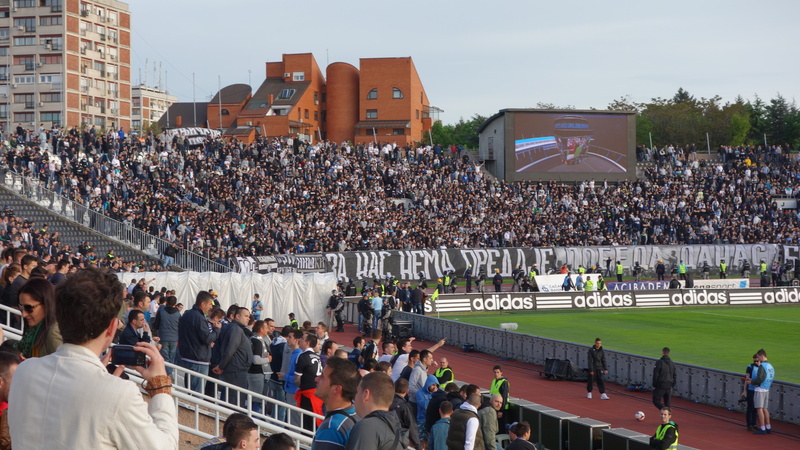 The half ended 1-nil to Partizan and the players quickly ran off the pitch to avoid random missiles and firecrackers, whilst Partizan fans scaled the score board to wave their flags triumphantly above it. Half time entertainment consisted of the rival fans chanting and singing songs for their team. Those clubs in the UK who think half time entertainment should consist of games of “on me shed son,” sponsored by Wickes (I kid you not, Wolves have done this) should take note. Back out for the second half and the game was momentarily delayed as the now, for some reason half-naked, Red Star fans erupted into a orchestrated, possibly Snow Patrol inspired display of flare waving. 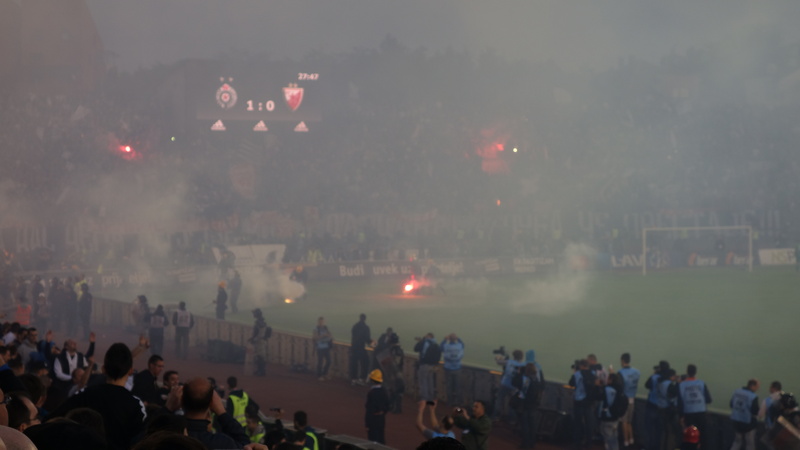 As smoke and flares rained down on the pitch, with the fire brigade running off to douse them in buckets I wondered if perhaps the outrage in the UK over the occasional smoke bomb in a stadium might be a tad of an over-reaction. With plenty of flares still going and smoke still drifting across the pitch, the referee obviously decided that he couldn’t be bothered to wait any longer, and the game kicked off again. Chances continued to be spurned by both chances, with Red Star pressing for an equalizer before finally in the 56th minute, Red Star equalised to send the North Stand into wild celebrations. As the game went on, it was clear, Red Star were happy for a draw that would still essentially hand them the title, whilst Partizan struggled to make headway in their attempts to grab a winner. It would be a shame I thought, for the game to end in a draw. This seemed to be the sort of match and rivalry for which their had to be an outcome. A draw would simply deny both fans closure. With time running out though it seemed inevitable, when suddenly, one of Partizan’s substitutes, a striker called Kojic, who I’m reliably informed almost never scores, made himself a hero to Partizan, connecting with a cross to put the home team ahead right on 90 minutes. 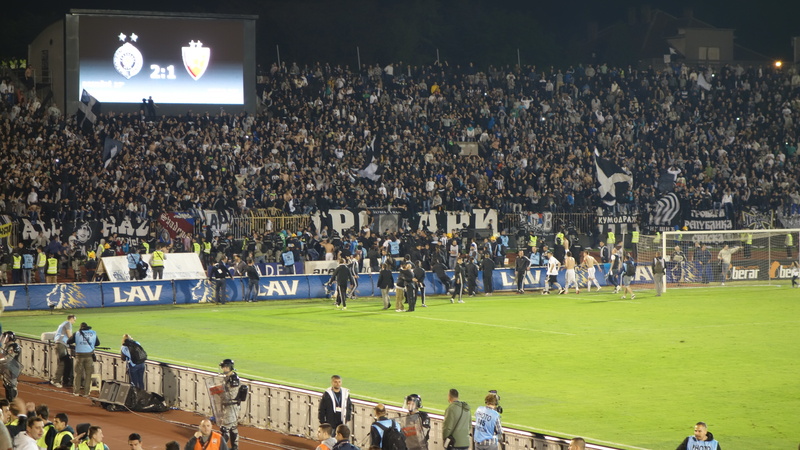 The game ended soon afterwards with the Partizan players celebrating riotously in front of their fans, whilst Red Star players went over to the North Stand to salute their efforts. 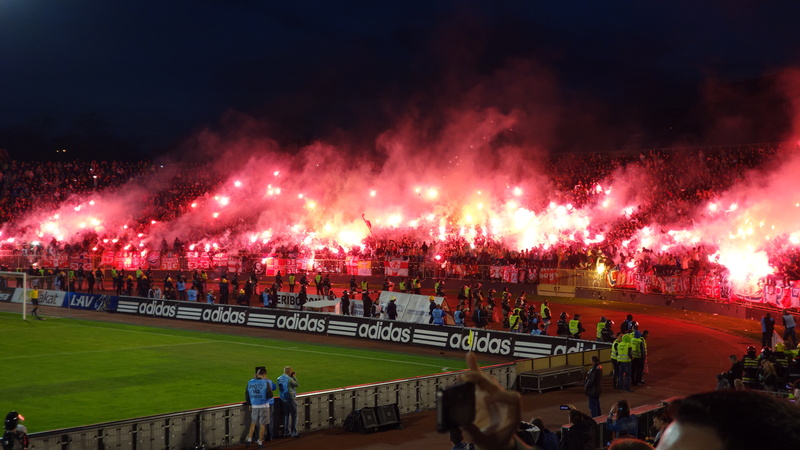 The drama was not quite over though, as somewhat inevitably, the Red Star fans proceeded to set fire to parts of the North Stand, no doubt in revenge for Partizan’s display of pyromania and the previous fixture. 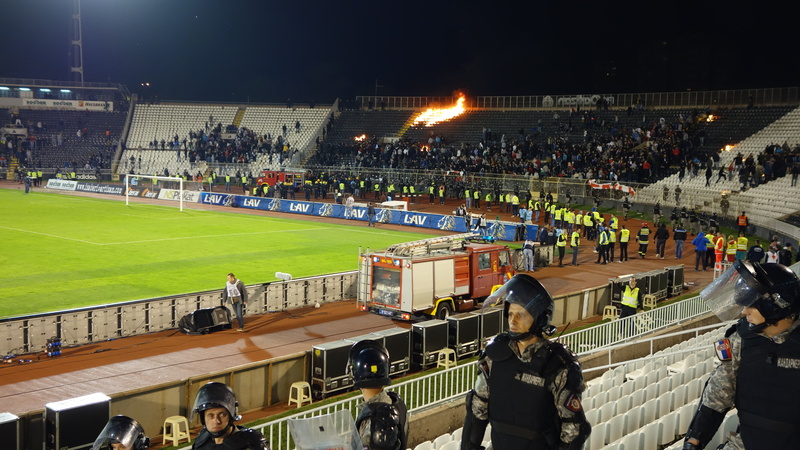 This seemed to upset the Partizan fans around me, but advancing riot police made it clear to them (and me) that it was perhaps time to go, just as the firemen began to douse the flames. As I left the stadium, fireworks were being set off outside to celebrate the result, whilst on the concourse fans were gathered around the windows to the dressing room. What a game, what an atmosphere, I thought, as I began the long walk back to the hostel. I’ll definitely be back, and if any of you get the chance too see a Red Star v Partizan game, I would whole heartedly recommend it. I even found out a way of making the riot police laugh. It seems however much protective body armour you are wearing, the sight of an English tourist looking at a map on his phone, only to then walk into a lamp-post and throw said phone through the air, arms wailing in a doomed attempt to catch it, will still raise a smile. Remember if you like this post or just want to massage my ego, you can share it, or follow my Facebook page, (link on the left hand column) or follow me on Twitter @noflytripping where I am endeavouring to post, amongst other things, a daily travel photo. oh, btw, I cant fully agree that the whole population is divided in between supporters of Red Star or Partizan. We call these two – “Tito`s Twins”, all time state-favorized clubs by financing, advertising, forcing us these two in popular culture, movies, etc etc. Thanks, did not know about that nickname but guess it explains why I hadn’t heard of any other club in Serbia!